Moofia: I found Mozzarella. And got Latte. MI first got the Moofia Baby Bottle at Paper Ya last year, but since then they have ran out of the little milk cartons and no longer sell them. 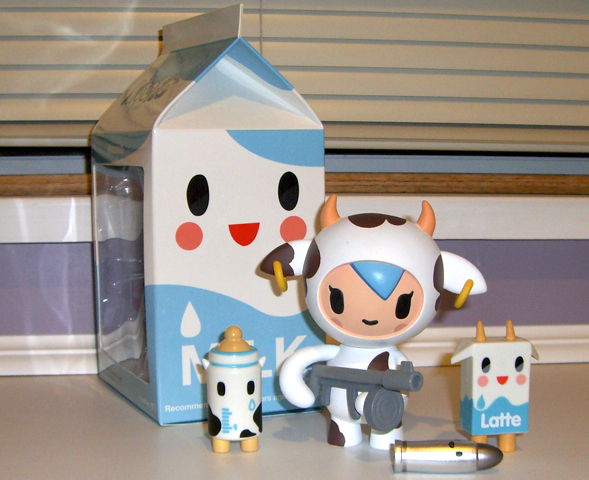 But last week I found a bunch of Moofia toys at Hills of Kerrisdale. Naturally, I bought a whole bunch, including Mozarella – which I have been searching for for a while now. I’m so glad I finally found her! Hills have some other tokidoki toys (a large but an incomplete collection) like Skeletrino and Bastardino, and a bunch of the little 1″ Cactus Pup blind boxes. I got a few of those, and another blind milk carton, which had Latte in it. Latte’s pretty cool. Now I want to complete my Moofia gang. And get Bulleto. And the Mozarella plush. This is kind of cool, making “caviar” from carrot juice and sodium alginate – totally geeky and foodie at the same time. I wonder what it tastes like. Maybe the mouth-feel is there, but the flavor? I mean, I guess caviar doesn’t taste like much, but it sure doesn’t taste like carrot juice! It’s all in the yolk. A buzz in health news headlines of the past few days has been this recent study, published in the April issue of the American Journal of Clinical Nutrition, which found that eating more than 7 eggs per week causes increased risk of heart disease. This was a 20 year long study done on over 20 000 “Harvard-educated male physicians” who like to eat more than one egg a day. There are flaws in the study, and I am not about to do a critical review on it, but the authors did point out an important thing, which is that eating more saturated and trans fats does worse for your blood cholesterol than does actually eating more cholesterol. But obviously, eating more than 7 eggs a week does seem a bit much. Another recent buzz may get a lot of people confused (or rolling their eyes at scientific research) – which is that eating more eggs can reduce the risk of breast cancer by 24 percent. The study was actually online before print in January and will be published in the June issue of the FASEB Journal. It is supported by previous findings that eating an egg a day or at least 6 eggs a week leads to a significant reduced risk of breast cancer. This is thanks to choline, present only in egg yolks (which also happens to be the cholesterol culprit. Ah, where is the happy medium?). The good news is, if you want your choline and are worried about cholesterol, or are vegan, whatever, choline can also be found in coffee, skim milk, cauliflower, liver, and wheat germ (egg yolks provide about 25% of the daily supply). And depending on whether you are an egg-lover or egg-hater, you can use either of these studies to back you up when you are in an argument. This is why I love being a research scientist. I used to have a thing against melons, I really did. I hated melons of all sorts – watermelons, cantaloupes and honeydews were my 3 most-hated fruits. I found them to be rather flavorless, and I hated the sandy texture of watermelon aboveall. I went so far as to declare myself deathly allergic to melons so that I didn’t have to eat them. When I decided that my palate had to become less picky in order to become more picky (if you get that), I decided to try all kinds of fruits and vegetables, and discovered that I didn’t hate melons so much, afterall. Because my mother gets a serious itch in her throat every time she eats honeydew, I have never really had too much of this fruit, even after my new-found fondness for melons. Strangely (and luckily) this doesn’t happen with watermelons or cantaloupes. This kind of reaction is known as Oral Allergy Syndrome, or pollen-food allergy, where your immune system mistakes a certain food protein as pollen proteins, so that after you eat a certain food- typically raw fruit or vegetable – you get a burning sensation in your mouth and/or throat. OAS thus happens a lot in people who have hay fever, or some kind of pollen allergy. Melons are associated with sensitivity to ragweed or grass. (While some other veggies like carrots and celery are associated with mugwort allergy). Typically, these reactions are worse during pollen season. It’s hard to just buy a whole melon because I can’t finish it quickly enough. And I don’t buy pre-chopped fruit. Found this little half honeydew though, the other day, and it looked pretty fresh. Plus I have just been really wanting some honeydew. It was green, sweet, and delicious. I love cauliflower. And broccoli. I prefer them raw and crunchy, though I also like them cooked, or pureed into a soup. If I had to choose, though, cauilflower edges out broccoli for me. They are crunchier, sturdier, and doesn’t have as strong a smell. You also don’t get little green flowers stuck in your teeth after. I always have cauliflower in my fridge, it’s my vegetable staple. Due to the way they flower, the broccoflower is considered to be more closely related to the cauliflower, and is put in the same Botrytis group of Brassica oleracea (whereas the broccoli belongs in the Italica group of B. oleracea.) In fact, the texture is definitely cauliflower, and taste is more cauliflower than broccoli. Although, I would definitely say that there is a slight broccoli “sweetness” (some would say stench perhaps) and aftertaste, especially in the trunk parts. The first breakfast cereal was created Dr. James Caleb Jackson in 1863; it was called Granula. Granula was made from heavy grains of Graham flour rolled into sheets, baked, dried, then broken into bits. This early version of today’s granola was dense and difficult to chew. Not exactly breakfast friendly. Dr. John Harvey Kellogg ran a sanitarium for health and diet reform called Battle Creek. In 1895, he created a cereal called Granose (flakes made from wheat) as an easily chewable breakfast for his patients. Granose was a flop , because JH was not exactly business savvy. John Harvey’s younger brother, Willie Keith Kellogg, was a book keeper at the sanitarium. He was the business savvy one who couldn’t stand by and watch his brother’s creation be stolen by Post. And so Willie Keith goes off and created his own cereal company in 1906, which eventually became the Kellogg’s Company as we know it today. I love flaked cereal – it is a staple. It is a breakfast thing, and it is a snacky thing. But I am no fan of Kellogg’s stuff. Unfortunately, the world of marketing had WK turning the wholesome, healthy cereal that his brother created into something so frosted that kids are bouncing off walls after their morning dose. I’m sure that’s not the idea that John Harvey had in mind. And that is definitely not what I like in my bowl. Luckily, there are those who like to stick to the basic principles. One of my favorite cereals is Nature’s Path Flax Plus. It’s a crunchy, thickish, flaked cereal – organic, very high in fibre (like, very), with 500mg of Omega-3 per serving. Like most bran flakes, it is only very slightly sweet (but it is sweeter and toastier than, say, very bland All Bran), so it goes well with dried fruits and stuff. I buy them in the giant jumbo 1kg version and go through it in a few days. But – if you have eaten this cereal quite religiously over the past while, you will no doubt know that they changed something in it a couple of months back (I’d say around the Fall of 2007): The flakes are now crunchier, a bit harder, and maybe a tad sweeter. There are more dark flecks on it. I also remember seeing one less ingredient (something like rice flour). And for those of you who are counting, you’ll notice that the calories per 3/4 cup serving has increased by — *gasp* — 10! Yikes! Better get off that couch to change the channel! Hahaha.